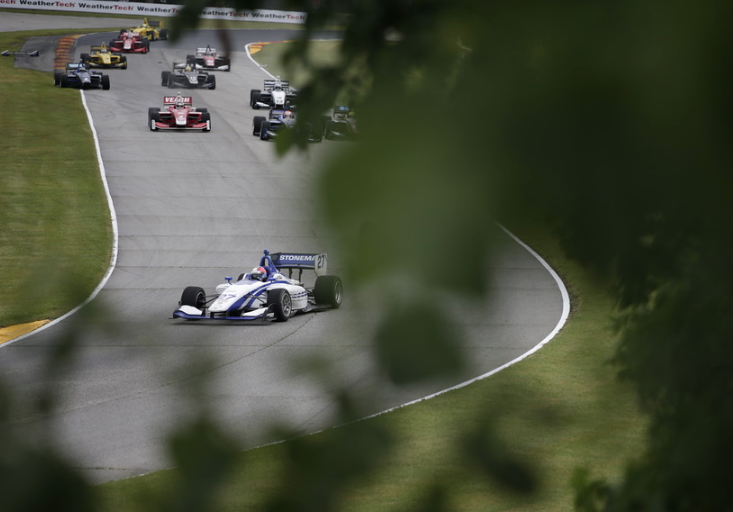 Indy Lights Race 2 Presented by Cooper Tires Road America, Elkhart Lake, Wisconsin, USA, 26th June 2016. Cruel luck put paid to an epic drive from Dean Stoneman as he looked to collect his 5th podium in five races. Starting once again from 5th, Stoneman pulled off another stunning start and made his way through the field. The 25 year old looked at home of the wet track as he skillfully picked off places up to second. Following an on track crash, the race was put under full course yellow whilst the damaged car was collected. From the restart Stoneman went wheel to wheel with championship rival Jones and managed to edge a lead and looking strong for another win. Two corners later, Jones had other ideas and forced Stoneman on to the grass at the cars came together. The resulting collision damaged Stoneman’s front right valve giving him a flat tyre. This was cruel for the British driver who was in dominant form. The Andretti team worked hard and sent the number 27 Stellrecht Mazda back out with slick tyres due to the drying track. Stoneman was then on a charge producing the fastest laps of the race, as he tried to un-lap himself and gain vital championship points. In a stunning display of driving Stoneman did manage pull back the one lap deficit and even make up places to finish a impressive 9th and with it three points for the position and fastest lap; but Stoneman deserved so much more. The result means Dean remains in second place in the series standings. The Indy Lights series now moves on to Canada and Toronto where Dean will look to strengthen his championship position.